This morning activists climbed Leduc #1, the oil Derrick that started western Canada's oil boom 70 years ago, at the Edmonton Energy Discovery Centre. 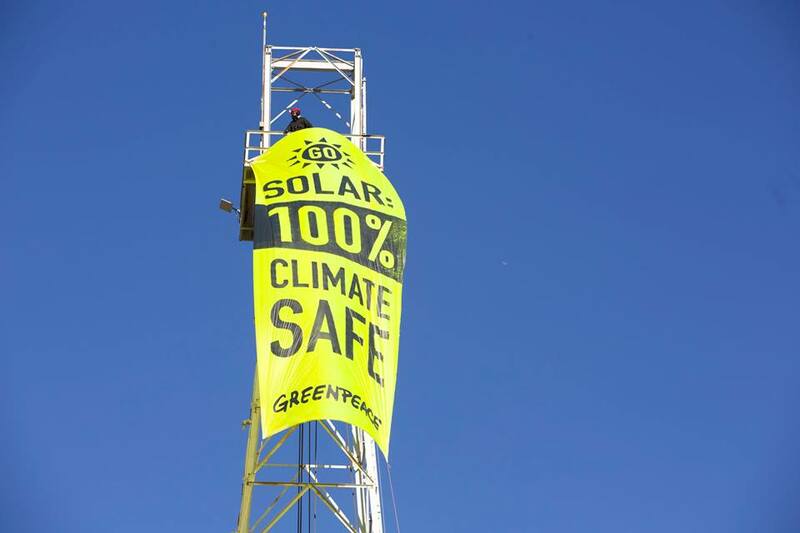 They hung a banner that read: “Go Solar: 100% Climate Safe", sending a clear message to the Alberta government that it’s time to transition away from fossil fuels to renewable energy – for the sake of our climate. They also set up a small solar panel atop the derrick, using its energy to power a sound system playing music proclaiming the power of the sun. Help us get the message to Premier Jim Prentice, tell Alberta to go solar! We know the transition to renewable energy is possible, we can see it happening all over the world. Bangladesh is installing nearly two new rooftop solar panel systems every minute. On some days, all of South Australia’s power comes from renewable sources. Exciting things are happening in Canada too. The T’sooke First Nation in BC is completely powered by solar energy, independent of the provincial power grid. In Ontario, an astounding 1 in 6 farmers now make additional revenue from renewable energy. And thousands of Ontario families, farmers, First Nations, cooperatives and municipalities have become renewable energy producers. The message is very clear: Alberta needs to catch up! But what’s the hold up? I know first-hand that Albertans want a greener future. Earlier this month I travelled the province talking about renewable energy solutions and there was resounding agreement that wind and solar are the way to go for the province that leads the country in climate pollution. Alberta has the best solar and wind potential in Canada, yet uses less than 1% of it. Alberta has the ability, the only hold up is the lack of government will to speed the process. Together, you and I can put pressure on the Alberta government to take the tar sands blinders off and embrace the province’s solar potential. Join us, tell Alberta to go solar! This is just the beginning, here comes the sun! We don't accept any money from companies or governments so we can be independent and challenge anyone who threatens the planet or peace. To help us keep fighting climate change, defending our oceans and protecting ancient forests, please make a regular donation. Thank you! If you no longer want to be in the loop with the latest news from these emails, we'll be sad, but you can unsubscribe here.